Amanda Roderick, MA History of Art student at Birkbeck, discusses Season’s Greetings, the Banksy piece that appeared on a garage wall in Port Talbot late last year, and the wider context of a crisis in arts funding. This is possibly the first time that Port Talbot has made news on Birkbeck’s blog – although I note that included amongst Birkbeck’s impressive alumni is one Ramsay MacDonald, the first Labour Party Prime Minster and MP for Aberavon in the 1920’s. Politics and connection to place are important in this story. 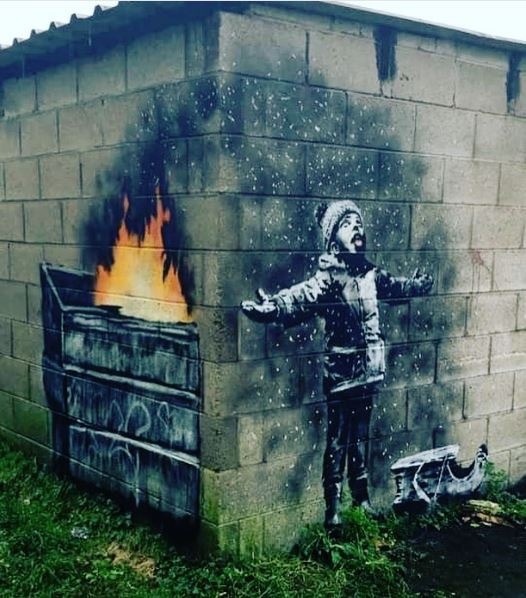 Last December, one week before Christmas, a striking image of what appeared to be a small boy enjoying the snow was discovered on a garage wall in Port Talbot. The site, a lane behind a row of early nineteenth century terraces in an area called Taibach (means ‘small house’ in Welsh), is sandwiched between the M4 and Tata Steelworks. Recognised and then confirmed as Banksy’s work within hours on his website and titled Seasons Greetings, it had his typical combination of hard-edged social commentary mixed with humour. In this instance, a small boy playfully sticking out his tongue with arms outstretched catching snow is bundled up for winter with coat, hat and scarf, complete with sledge at his feet. Only by turning the corner can the observer have a different reading – the flakes are not snow falling from the sky but ash blowing over the boy from what is either a burning bin or chimney. Subverting messages, questioning authority and creating political site-responsive work, is all familiar territory for Banksy. He’d played on Christmas before: in August 2005, he painted a series of images on the Palestinian side of the West Bank barrier erected by Israel, returning again in December 2007 with new images for ‘Santa’s Ghetto’ in Bethlehem. Port Talbot is my home town. The site of the Banksy is on the street I grew up in, its lane is the route my sister and I took as a shortcut to school every day, where we played in the evenings, learnt to ride our bikes – and interestingly where bonfires were a regular occurrence. Visiting the Banksy was the Boxing Day walk for many families – mine included – and the security staff in place there (paid for by the actor Michael Sheen who is also from Port Talbot) informed us that in the days leading up to Christmas alone, there had been around 2,000 visitors to this small lane, causing traffic chaos and security issues (the number of visitors apparently rose to a grand total of over 10,000). The guard also confirmed the stories of various attempts at vandalism and concerns that the work would be damaged, stolen or destroyed by those wishing to own a small piece. Life, news and the art world have moved on since then of course; the work has been purchased for an ‘undisclosed six figure sum’ which will be paid to the owner of the garage, a local man. John Brandler, art dealer, street art expert and collector of Banksy’s work, was the buyer; he, promised that it would remain in Port Talbot for two to three years but insisted it be relocated somewhere else in the town for protection: ‘The piece has a relevance with the surroundings. It is important for me to keep it in the town as art is very often specific to a place, especially street art. The piece conveys what Banksy is about – it has a social message and it doesn’t matter where you are. It is about global pollution. We are creating an environment in the planet that will wipe us out.’ He makes very pertinent points, importantly highlighting pollution – the dangerously high levels of pollution must be recognised as amongst the most damaging in the UK. It cannot however be attributed the steelworks alone. The fact that a motorway cuts through densely populated areas must also be considered. Apparently somehow ‘improving’ in recent years, in 1983 it was reported that the town was the most polluted place in Wales and the most polluted in the United Kingdom outside London – only Marylebone Road and Camden had higher levels. There is also no doubt about the level of support, enthusiasm and pride in the town. Cottage industries have popped up selling merchandise; Banksy’s work on mugs, key-rings, t-shirts and bags, with one man having the image tattooed across his chest! Questions have therefore arisen around ownership, copyright, intellectual property – and what it will mean if/when the work is placed in another environment or different context of a gallery/public venue. All are provocations which of course is what Banksy wants. It’s worth pointing out that Port Talbot was already on the cultural map before the new Banksy appeared. The school mentioned earlier was also the primary school Anthony Hopkins attended and for a time, the young Richard Burton lived a few hundred metres away in that same street, also attending the comprehensive school in the town. Michael Sheen’s 2011 promenade performance The Passion, produced by The National Theatre Wales, used a biblical account to tell a contemporary story of the town’s social history and the destruction of homes there to build the M4. Significantly, the two largest cultural events to take place in Port Talbot over the last decade – Sheen’s performance and the appearance of the Banksy – existed outside of any fixed or ‘physical’ venue and attracted audience numbers estimated in the tens of thousands, proving there is a need for what the arts can bring – and that engagement with the arts is a natural instinct and could not be stronger. This is despite the town not having any arts venue at all and very little provision for such activity – but lots of potential. Bristol, Banksy’s hometown, is a city where street art has been used to regenerate an area but there are examples closer to home in Cardiff and Swansea where the street art group Pure Evil has already been commissioned. 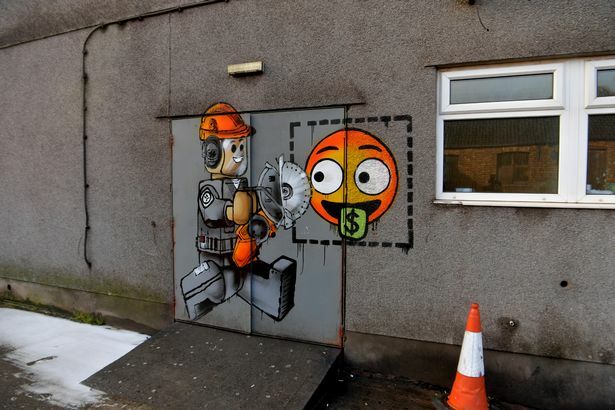 One new home being suggested for the Banksy work once it’s removed from the garage wall is the site of an old police station centrally based opposite Port Talbot Railway Station. Recently developed by social housing group Pobl (translates as ‘people’ in Welsh) the £4m development has flats on the top three floors and would provide the visibility, space, protection and accessibility required with its large glass windows facing onto the street, on the ground floor. Brandler has said he would be prepared to show some of his personal Banksy collection there, adding that he was also interested in developing education and participation opportunities with groups in and around the town, proposing a ‘street art school together with a cafe run by people who were homeless or unemployed’. At a time when the Welsh Government is undertaking a consultation process regarding the site of proposed new modern art gallery in Wales, Port Talbot council must surely be hoping this boosts its chances. For now, Port Talbot joins the list of international locations and institutions in providing a home to prized Banksy work. It follows a flurry of Banksy news in recent weeks. His fake £10 banknote depicting Diana, Princess of Wales named Di-faced Tenner, joined the British Museums collection of coins, medals and other currency in February 2019; Love is in the Bin, the self shredding work memorably auctioned at Sotheby’s in October 2018 and a poignant artwork on the fire door at the Bataclan theatre in Paris thought to be Banksy’s homage to the 90 victims who died in a terrorist attack on the venue in November 2015 has been stolen. Ame72 Lego Mural, Feb 2019. Taibach Rugby Club, Commercial Rd, Port Talbot. There is a very important backstory here however and Brandler through his patronage perhaps unintentionally foregrounds the crisis that now looms. The danger for Port Talbot is that all the excitement generated by the media will fade and, as with other areas across Wales, these rare moments of inspiration and opportunity are rarely appreciated and acted upon by the Local Authority and Welsh Government. Without the philanthropy we have witnessed here, it is difficult to envisage how artists and small regional arts organisations will thrive and survive as public funding rapidly dwindles. The UK is fast approaching the US model of reliance on private and charitable funding – a strong tradition there, its infrastructures are built up over many generations where money is usually raised by wealthy Board members and Trustees. The encouragement of similar ‘business’ models in Wales has been a brutal transition into a different kind of dependency and one not easy to achieve, especially in the poorer regions or inner cities of Wales and England. Here there can often be little or no track record, resources or economic success related to individual giving and corporate sponsorship. An arts venue in Port Talbot off the back of the Banksy would be hugely beneficial but the reality is that any new or ‘redeveloped’ space for showing or producing art, would come with unaffordable rents, overheads and often insufficient budget allocation to pay its artists and staff properly. It would, like, increasingly, the NHS and many school classrooms, be reliant on volunteers for many front of house staffing and operating responsibilities. Secondly, there is a question as to whether urban graffiti is the only kind of art that can now be truly accessible, affordable and popular in some areas. It does not require a building but will it always need to be covered with ugly protective screens and fencing (as is the Port Talbot Banksy). What of the emerging, local artists, the art students and grassroot collectives? How and where will they make their art, who will pay to see it, buy – and how will it be collected, maintained and archived for the future? There is now a fascinating interzone where a guerrilla street artist like the character known as Banksy is collected and patronized by Hollywood stars. Stencils and strategic cartoons are either destroyed as acts of public vandalism or endorsed by changing hands for huge amounts of money. And you have to argue over the fabric of the city as to whether this is the art the authorities want to sponsor (as they have done in St Leonards-on-Sea, by immediately sealing a Banksy paint job under perspex); or whether, in some way, these interventions should remain an encrypted secret. We live in a society avid for gathering up anything that seems to have spirit; anything that is dangerous can be captured and converted into a form of energy. Which is also wealth, money and credit. All images and John Brandler quotes courtesy of Wales Online & BBC Wales.